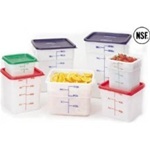 Food Storage Containers for restaurants and foodservice are designed to keep leftover and prepped ingredients fresh and sealed tight. 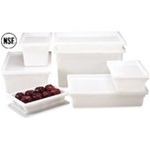 These restaurant grade plastic food containers are strong and durable for a long commercial life. 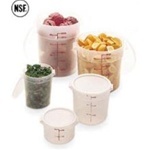 Food storage squares and rounds available from Cambro are used in refrigerators, freezers and other spots in the kitchen to store food and prep compactly to save space. 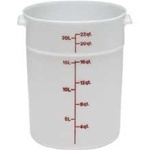 Cambro Plastic Container Clear 12.5 Gal. Rectangular Reusable Plastic Food Container Set Black - 16 Oz. Rectangular Reusable Plastic Food Container Black - 28 Oz. Rectangular Reusable Plastic Food Container Black - 38 Oz. Rectangular Reusable Plastic Food Container Black with Clear Lid - 12 Oz. Cubeware Rectangular Plastic Container Black - 48 Oz. Cubeware Rectangular Plastic Container Black - 56 Oz. Rectangular Reusable Plastic Container Black and Clear Lid - 28 Oz. 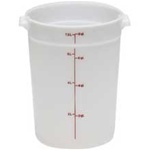 Rectangular Reusable Plastic Container Black and Clear Lid - 38 Oz. 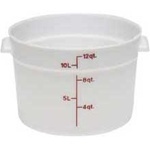 Rectangular 2 Compartment Container with Clear Lid - 28 Oz. Rectangular Reusable Plastic Food Container Clear - 16 Oz. 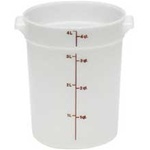 Square Reusable Plastic Food Container - 48 Oz. 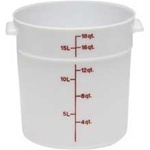 Buy your restaurant supply Food Storage Containers and boxes from the leader in restaurant supply. 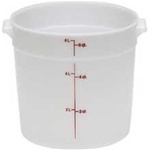 Choose from round or square plastic food containers that stack neatly in your pantries and coolers.